AmeriTemp has a large variety of portable air conditioning rental air conditioners to meet your every need. Indoor Portable ac units air conditioners serve as an alternative to window or wall air conditioners or as a supplement to central air conditioning. . Some owners say Indoor Portable ac units (air conditioners) are more desirable than through-the-wall installation in homes that can't accommodate window AC units. 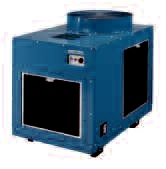 Portable air conditioning rental is easy installation will not require any lifting,. These units are on casters. They can move them from room to room hospital, manufacturing commercial and industrial applications.. Placed Indoor Portable ac units close to a window to run the exhaust hose outside. Operates automatically after-hours or during weekends. Motor Output - high/low 0.04/0.013 kW Evap. 0.1/0.025 kW Cond. 0.04 kW/NA 0.14/0.08 kW 0.24/0.19 kW 0.48/0.41 kW 0.21/0.13 kW Evap. 0.33/0.13 kW Cond. 0.6/0.33 kW Evap. Motor Output - high/low 0.14 kW 0.24/0.19 kW 0.35 kW 0.55/0.38 kW 0.75 kW Evap. 0.40 kW Cond. 0.75 kW Evap.